Heat oven to 350° F. Spray cookie sheets with cooking spray. In large bowl, beat sugars, butter and oil with electric mixer on low speed until blended. Beat in chocolate syrup, egg whites, egg and vanilla. Beat in flour, cocoa, baking soda and salt until well blended. 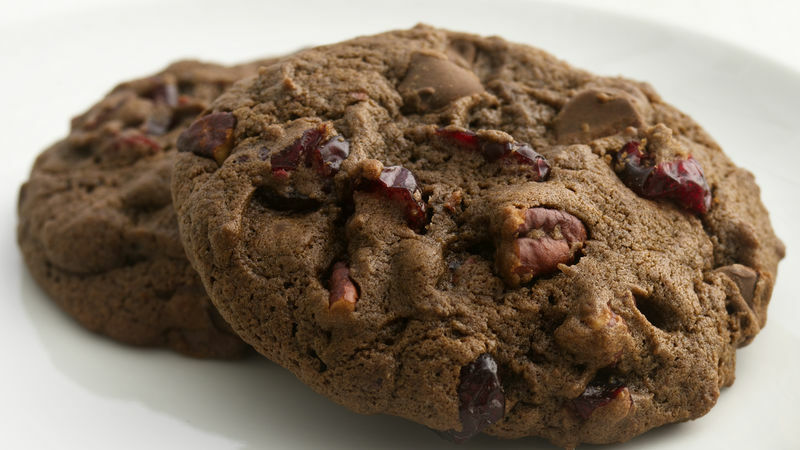 Stir in chocolate chips, cranberries and pecans. Drop by slightly-rounded measuring tablespoonfuls about 2 inches apart onto cookie sheets. Bake 10 to 13 minutes or until set. Cool 2 minutes; remove from cookie sheets to cooling rack. Cool completely, about 30 minutes. *To toast pecans, heat oven to 350° F. Spread pecans in ungreased shallow pan. Bake uncovered 6 to 10 minutes, stirring occasionally, until light brown. No-trans-fat 68% vegetable oil spread can be substituted for the butter. The cookies will spread less and retain a more rounded shape. You can bake smaller cookies for your holiday cookie tray. Drop dough by level measuring tablespoonfuls onto cookie sheet. Bake 7 to 9 minutes. Makes about 5 1/2 dozen cookies. 44% less fat • 55% less sat fat • 27% fewer calories than the original recipe. Favorite dried fruit replaces half the chips for tasty result!